In situations of stress or during feverish infections, the horse often cannot synthesise vitamin C in sufficient amounts. derbymed® Bronchopulmin contains vitamin C as ascorbyl palmitate, the most available form of this vitamin for horses. Next to the musculoskeletal system, the horses most stressed and most affected organ is the respiratory tract. derbymed® Bronchopulmin actively supports the natural resistance and boosts the recove­ry of your horses respiratory tract. Bronchopulmin combines the characteristics of mucolytic substances with ingredients that strengthen the immune system. Eucalyptus oil naturally contains 85.0 % cineol, which has mucolytic, antiinflammatory and anti-bacterial effects. Black cumin oil dilates the bronchi, soothes pain and strengthens the immune system with lasting effects. 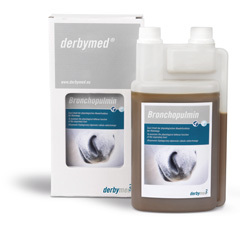 Bronchopulmin is given with the feed or administered using a mouth syringe.